What happens when you extend the idea of public interest to privacy? There's an inevitability about the renewed debate over privacy laws. The Australian media is ready for the fight, with complex questions over how any framework would operate. The Age's flagship film critic Jim Schembri has taken a swipe at the state of journalistic ethics at his employer, suggesting ethical standards have become an "optional extra rather than an ethos". Patrick McGrath was there for the spray. Former editor Michael Gawenda wants to know what happened to The Age archives, revealing that when he left in 2004, the archives still existed but were in an appalling state of neglect. 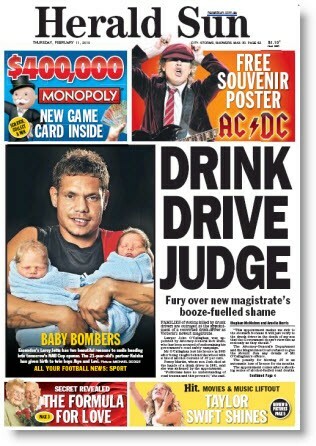 Some nice confected tabloid outrage at the increasingly negative Herald Sun today, with a cover story of a drink driving charge from seven years ago. Compare that to a rather similar drink driving story about the Hun's own editor.